Damaging earthquakes like the 7.8 magnitude quake in November 2016 can leave behind them a trail of destruction. Movement of household items is one of the biggest threats to the family’s safety. Fortunately, there are some simple things you can do to help minimise damage and injury from earthquakes. On Wednesday 14 November, Habitat for Humanity distributed Quake Ready kits around Kaikoura and Waiau for future earthquakes and aftershocks, so that you can be prepared. Our aim is to help you minimise the risk of damage to your homes and protect your family. You can find all the details about how to use the QuakeReady kit here. 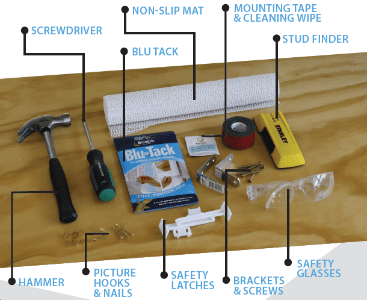 The Quake Ready kit contains all the tools and items in the image below, as well as instructions for how to use the contents to make your home ‘quake ready’. Registrations for the quake ready kits have now closed. Stay posted for updates on how the distribution went on the 14th of November!